Preheat oven to 350°F. In a large bowl or stand mixer, mix together cookie mix, 1/4 cup butter, egg, oats and water. 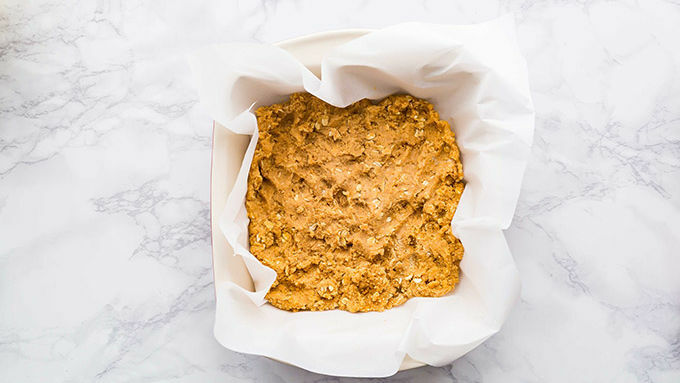 Press into a nonstick or parchment-lined 9x9-inch baking pan. Bake 20-22 minutes, or just until the center sets. Whip together peanut butter and 2 tablespoons butter. 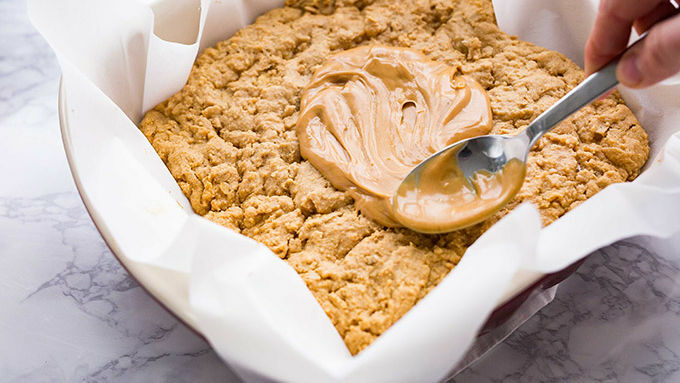 Gently spread mixture across top of hot peanut butter bars. Let bars cool completely. 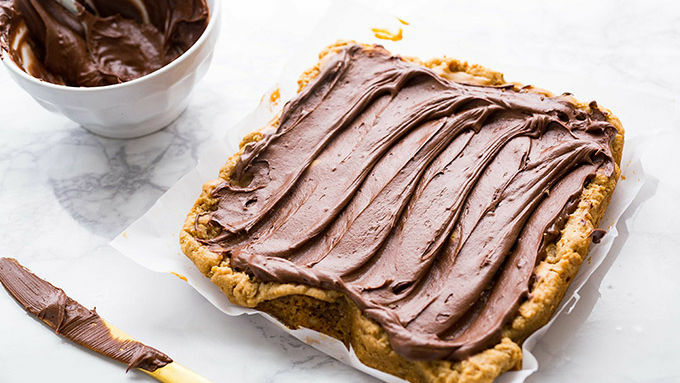 In a large bowl or stand mixer, beat together 1/4 cup butter, powdered sugar, cocoa powder, vanilla and just enough milk to make spreadable frosting. Frost cooled bars, cut into squares and serve. For a more chocolaty frosting, add another 1 tablespoon of cocoa powder. There were three hot lunches you waited for when you grew up in Utah. The first was grilled cheese. Giant slabs of toasted bread, cheese baked into the center. Sliced into triangles with a pizza cutter and served with a side of sweet and creamy tomato soup. It was the stuff of elementary school dreams. The second, “dirty diapers.” To this day, I literally do not know the real name of this meal. But it was tiny bundles of pie crust, wrapped around gravy beef. The boys always teased you when you took a bite: “dirty diapers, dirty diapers.” But you kind of didn’t care, because those things were delicious. But the pièce de résistance of school lunch was the peanut butter bar. Soft peanut butter and oatmeal cookie on the bottom, chocolate frosting on the top. When the school lunch calendar was printed off each month, you’d stand over that green sheet of mimeographed paper, sounding out words until you found the ones that read “peeeanut butterrrr barssss.” And then, you’d circle it with your sparkly Lisa Frank pencil, hang it on your wall next to your Donny and Marie poster, and count down the minutes until the lunch ladies served up Peanut Butter bars on Wednesday. Or Friday. Or whatever glorious day was circled on the calendar. Since you already know how to make grilled cheese, and you likely don’t desire “dirty diapers” for dinner, I figured peanut butter bars were the finest taste of childhood to share with the world. 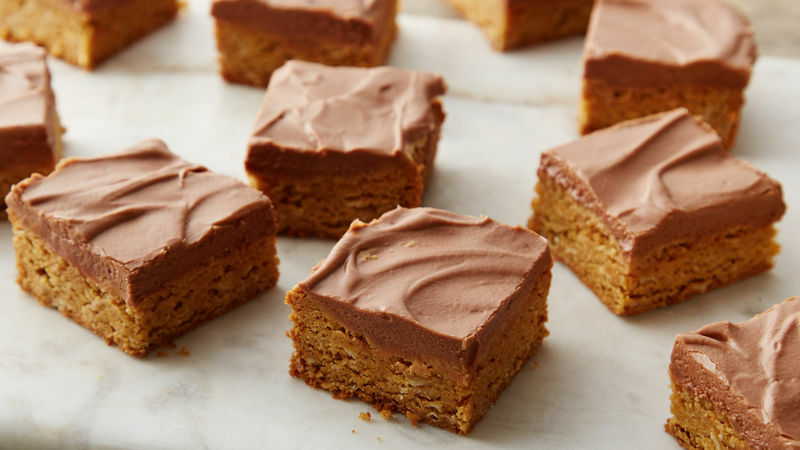 So turned that tasty treat from childhood into an easy dessert bar, using ready-to-go Betty Crocker peanut butter cookie mix as the base. Tastes just like the original. This recipe takes me right back to all of it. With blessedly smaller bangs, and far less Aqua Net than I used back then. So maybe this version is even better.